There’s a star about 370 light-years from here that’s pulsating in response to its unusually heavy planetary companion. It’s the first time that astronomers have seen this sort of interaction between a planet and its host star. A new study published in Astronomical Journal Letters is the first to document planet-induced pulsations in a stellar object. The star, dubbed HAT-P-2, appears to vibrate every 87 minutes, which corresponds perfectly to the harmonics, or multiples, of its lone planet’s elongated orbit. Astronomers have observed star-on-star pulsations before, called “heartbeat stars,” but such behavior is unprecedented for a star and a planet. 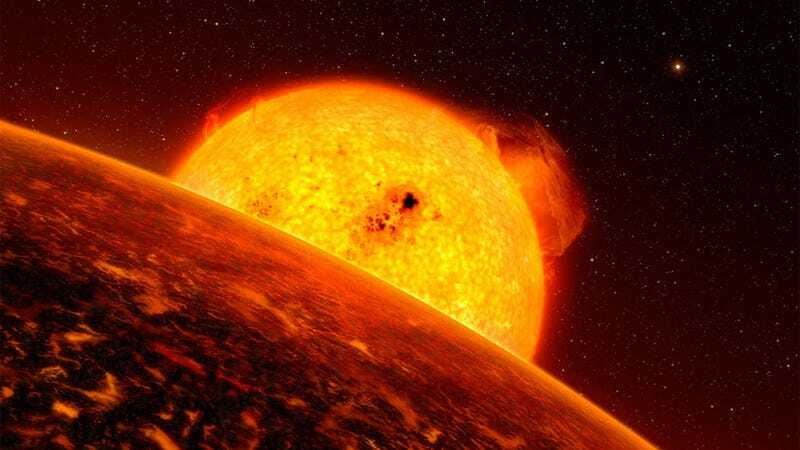 Even though it takes the planet 5.8 days to complete a single orbit, there’s something going on between the two objects that causing the molten surface of the star to flare-up, or pulse, at 87 minute intervals. A team led by Julien Wit, a postdoc at MIT’s Department of Earth, Atmospheric and Planetary Sciences, says the planet isn’t heavy enough, or close enough, to cause such a dramatic stellar pulsation on its own, creating something of a cosmological mystery. The pulsations may have something to do with the planet involved—a particularly heavy hot Jupiter dubbed HAT-P-2b—and its eccentric orbit. This planet is roughly the same size as our Jupiter, but its mass is nearly nine times greater. In fact, HAT-P-2b is one of the heaviest planets ever discovered, with a gravitational pull that’s nearly 24 times greater than that of the Earth. Its elongated orbit sees it spin around its host star once every five days and 15 hours. This orbit takes it from 4.9 million miles away at its closest approach to 15.4 million miles away at its most distant (by comparison, Mercury is about 58 million miles away from the sun). Every time HAT-P-2b makes a close approach, it absorbs a horrendous amount of energy in the form of heat, and then expels much of it as it reaches its most distant aphelion point. Lucky for us, astronomers can observe this orbit directly from Earth. Our vantage point allows us to watch HAT-P-2b as it eclipses its star every 5.8 days, allowing scientists to collect various types of data, including dips in brightness, temperature, and so forth. Using NASA’s Spitzer Space Telescope, the team at MIT managed to collect 350 hours worth of data between July 2011 and November 2015. While attempting to develop an orbital temperature map of the planet, the researchers watched as it moved, or transited, in front of the star, and then disappear directly behind it. When the planet was in this “secondary eclipse” phase behind the star, the astronomers recorded an unexpected spike in the data—a series of oscillations in the star’s brightness lasting approximately 87 minutes. Importantly, this figure is an exact multiple of the planet’s orbital frequency, or rate at which it circles its star. Each time the planet swings around the star, the gravitational forces of the two bodies interact. As the planet makes its closest approach, its gravity hits the star like a bell, causing the stellar body to periodically “ring” through the course of the planet’s orbit. Trouble is, the star’s vibrations should be much quieter and at a lower frequency than what was observed. The researchers were able to rule out interference with the Spitzer instrument (such as internal vibrations), or a phenomenon that’s produced by the star alone. If this interpretation is correct, it means that planets can have a significant impact on the physical processes operating on their host stars. This heavy planet is disturbing the star enough to tip it toward a self-pulsating state. As to the exact mechanism behind that process, that still needs to be determined.